White on white. 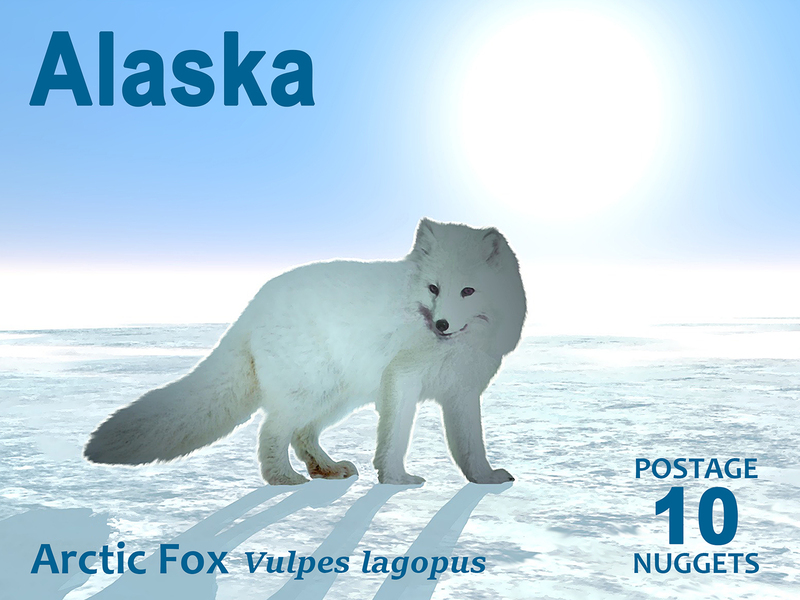 A new 10-Nugget postage stamp, featuring an Arctic Fox, a digital painting of an Arctic Fox, Vulpes lagopus, on the polar ice, has just been issued by the Alaska Postal Authority. The sun hangs low in the bright blue arctic sky. Do not stare at the sun as it can harm your eyes. The Arctic Fox is comfortable in deep cold; it does not begin to shiver until temperatures drop to about −70 °C (−94 °F) due to its dense, multi-layered fur. Other adaptations to a frigid climate include fur on the soles of its feet, short ears, and a short muzzle. Arctic foxes live in burrows, in a blizzard they may tunnel into the snow to create shelter. The coat of the Arctic fox, sometimes blue-gray, is very effective winter camouflage. The natural hues allow the animal to blend into the environment. 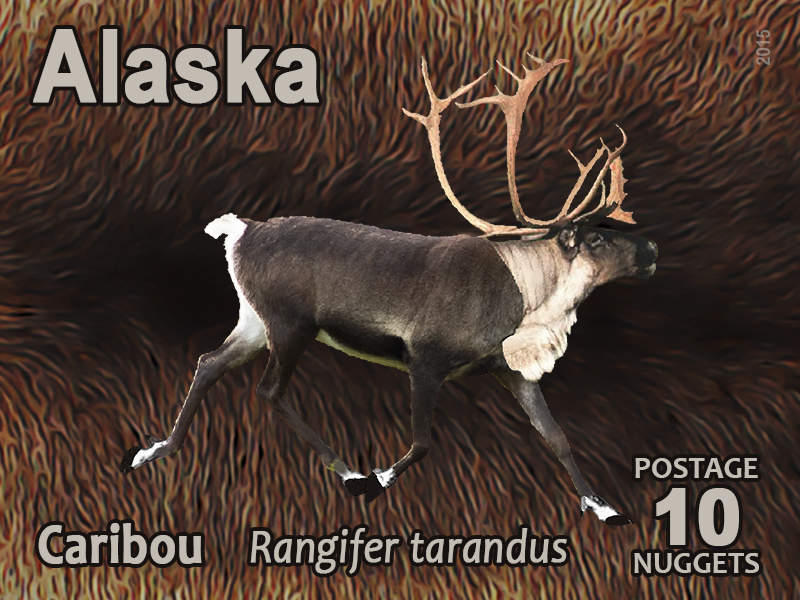 During the short warm season its coat changes to brown or gray, again acting as camouflage in tundra rocks and plants. During the winter, when prey is scarce, the foxes follow hunting Polar Bears on the ice pack feeding on scraps. During the summer the eat rodents, birds, eggs, and even fish. They will also feed on berries and seaweed. Arctic Foxes have extremely keen hearing, aided by their wide, front-facing ears, which allow them to locate the precise position of their prey beneath the snow. If it hears something moving under the snow it leaps into the air and pounces, punching through the snow to catch its prey. The range of the Arctic Foxes is circumpolar; they can be found throughout the far north. 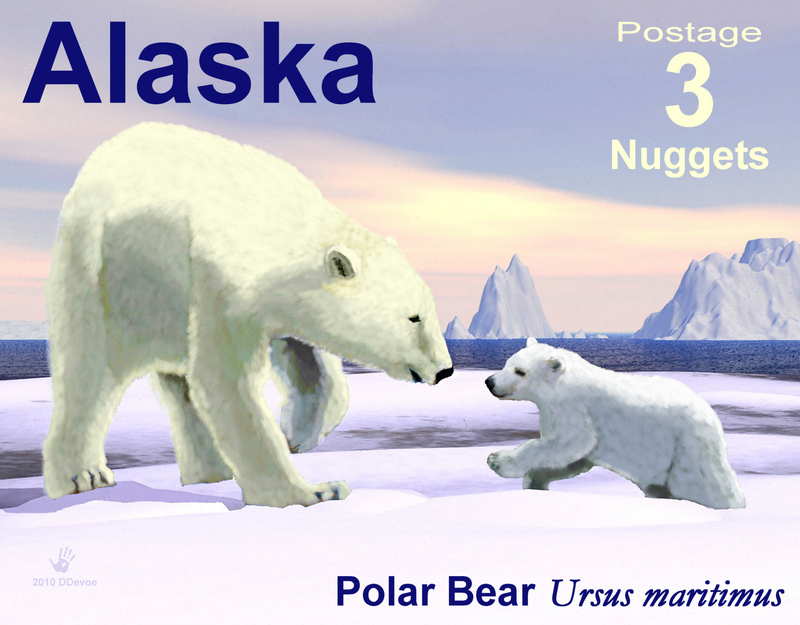 The only land mammal native to Iceland, it arrived by walking oversea ice at the end of the last ice age. The species is in generally good shape except for the population on the Scandinavian mainland. However it is losing out to the larger Red Fox where their ranges overlap.